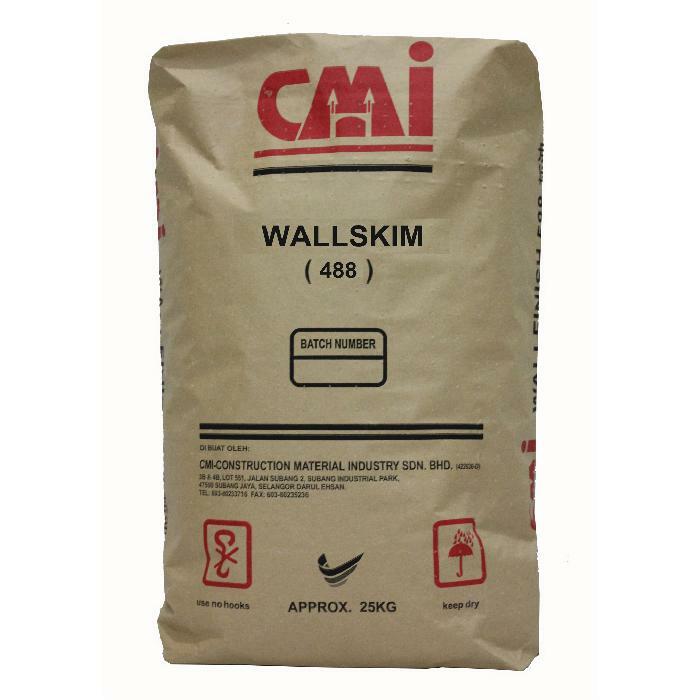 CMI WALLSKIM 488 | CMI Marketing Sdn. Bhd. CMI WALLSKIM 488 is a high quality polymer modified water-resistant cement-based thin finishing coat for plastered walls or ceilings. It is also good for surface improvement works to block wall and wet rendered wall surfaces. CMI WALLSKIM 488 should not be used on painted surfaces. Filler : Clean Graded Limestone. Additives : Water soluble polymers to improve workability, water-retention and adhesion. Aggregate size : O.5 mm max. Coverage : Approximately 1.2 kg- 1.3 kg/ m2 / mm thick. Recommended thickness : 1 – 3 mm per coat. Density : Dry ± 1.3 kg / litre ; Wet ± 1.6 kg/ litre. Toxicity : Chemically inert and non-toxic. Mixing ratio : Approximately 42% water on dry material. Receiving surface for plastering must be sound and free from dirt, dust, grease and traces of foreign materials that will affect adhesion. 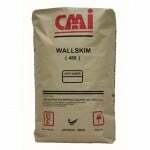 Where necessary, dampen the dry concrete or rendered surfaces before application of CMI WALLSKIM 488. Add a 25 kg bag of CMI WALLSKIM 488 to approximately 10.5 liters of clean water. Use a power drill to mix thoroughly. Allow mixture to stand for 1O minutes for additives to dissolve. Before using the plaster, mix again. Apply by using a steel trowel or spatula. CMI WALLSKIM 488 should be applied as a smooth finishing plaster for rendered or base coat plaster when the surface is damp or touch dry. This should result in a consistent colour finishing with minimum shrinkage cracks visible. Storage life is approximately 6 months if stored in a cool and dry place. Note : Because it is not possible to give specific instruction for the various site conditions or to control the applications, the information here is for general guidance only and does not constitute an offer of warranty by the manufacturer. © 2009-2018 CMI Marketing Sdn. Bhd.. All rights reserved.